This is one of my favourite art pieces I have created recently and was ‘constructed’ using two different photos of daisies, one a close-up and the other a group of daisies. 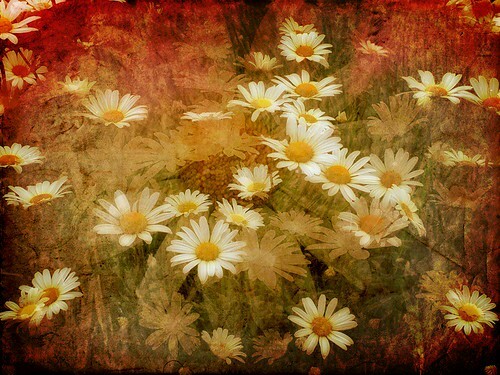 The image has many different textures added to it to create an artistic rendition of a field of daisies. The textures and effects were made in Photoshop with various filters and texture files overlaid as separate layers. These had masks applied and other filters and layer blends added which has given the piece the deep tones and rustic feel. After getting a Photobox print to check it looked good enough I got it printed on a large canvas and it looks absolutely stunning on the wall! You can purchase this piece of art yourself as a wall print here from the Fotoviva Art Prints online gallery.